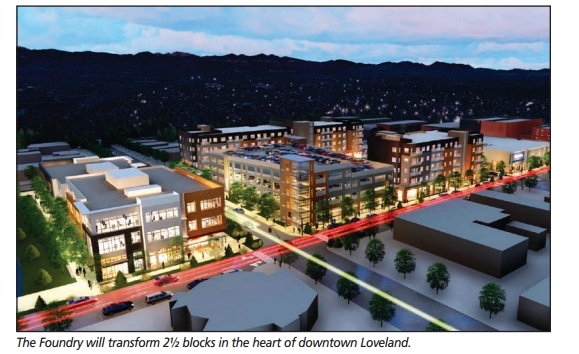 Brinkman Partners and the city of Loveland are sculpting a new future for downtown Loveland. A $75 million redevelopment called The Foundry will bring new apartments, retail space, a five-screen movie theater, community plaza, parking garage and a hotel or office space to a 2½-block area in the heart of downtown. The property stretches from East First Street to the Back Stage Alley (between East Third and Fourth streets) and is bordered to the east and west by North Cleveland Avenue and North Lincoln Avenue. A half-dozen years in the making, the project, formerly known as the South Catalyst Project, will break ground by April and deliver in summer 2018. It’s called The Foundry because, “One of the things we wanted to do was to honor what’s unique about Loveland,” Hardy said. The city is known internationally for its sculpture exhibitions and bronze foundries, and The Foundry, he said, represents art, imagination and starting anew. Brinkman Partners originally envisioned The Foundry as a two-phase project with 60,000 square feet of office space comprising the second phase. However, “We think there’s a much higher demand for a hotel there,” said Hardy, noting with a hotel, the development would be completed in a single phase. There hasn’t been a new hotel built between downtown Loveland and Centerra (at Interstate 25) in 20 years, and hoteliers are eager to capture leisure and group travelers, including those headed to Estes Park. The hotel likely would be a four-story, approximately 60,000-sf facility with 90 to 100 rooms. “We’re pretty excited about that and think it would be a neat opportunity for the project,” Hardy said. The hotel would be located between First and Second streets. From Second to Third, The Foundry will include two five-story mixed-use buildings, one with 100 apartments over 8,000 sf of retail space and one with 7,000 sf of retail and 46 apartments; a central plaza with a stage and water features; and a four-story, 460-space parking garage with one level below grade. The section between Third and Back Stage Alley, behind the Rialto Theater and restaurants on Fourth Street, will feature a 625-seat movie theater, for which there is a signed letter of intent. Alleys will be transformed into well-lit pedestrian corridors. The city of Loveland assembled the redevelopment site over time and has demolished existing structures, giving Brinkman Partners, which was selected from a requests-for-proposals process, a clean slate with which to work. Brinkman completed the five story Gallery Flats mixed-use apartment building nearby in 2012. “It has performed very well for us and our investors,” said Hardy. “We feel very good about the market,” he said, adding that the opportunity to do a public-private partnership for The Foundry was compelling. The Foundry is estimated to generate $11,000 a day in new retail sales in the downtown area – or $40 million over 10 years – not to mention the jobs, property taxes and community benefits, including additional redevelopment, it will create. The development team includes OZ Architecture and Russell + Mills Studios.